Ohio residents can find a new or used Jeep Renegade to drive around town or on exciting adventures. No matter the weather, the Renegade is there to get you to your destination, with plenty of features that Ohio residents love and a range of model choices. The Renegade is the most affordable Jeep SUV in the lineup as well as the smallest, offering excellent maneuverability. With the Jeep Renegade, there is plenty to enjoy. The smaller size of the Renegade compared to other Jeeps makes it much easier to maneuver and park, so you never have to pass up that tiny parking spot. Even with its comparatively smaller size, the Renegade appears tough and rugged. The fog lamps help you see in a range of weather conditions. On a nice day, you can put the My Sky Removable Panel Sunroof to good use by removing or retracting the roof panel to enjoy some fresh air. When the weather turns cold, take advantage of the available wiper deicer to clear your windows in no time and the heated exterior mirrors to ensure visibility. The tough capabilities of the Renegade make it an excellent choice whether you are driving through snow or off the beaten track. The Jeep Renegade Trailhawk, in particular, is perfect for adventurous Ohio drivers. Ohio residents do not need to sacrifice interior comfort and features for the Jeep Renegade’s capabilities. Enjoy premium mesh seating or leather trim along with heated front seats and 8-way power-adjustable front seats. There is plenty of interior storage, including folding rear seats. In addition, the Renegade gets the latest Uconnect system, so you are always connected. What Makes the Renegade Different from Other Jeeps? The Renegade has the same tough styling as other Jeeps as well as many similar features, such as its off-roading capabilities and removable panels on the roof. It stands out in terms of both size and pricing. 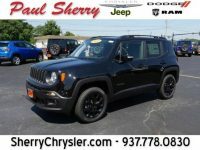 The Jeep Renegade is the most affordable of the Jeep SUV lineup, making it a great option for Ohio drivers who want the capabilities and features of a Jeep without breaking their budget. Its small size also makes it highly maneuverable, perfect for driving around cities or fitting into tight parking spaces. You can choose to configure your Jeep Renegade with either front- or four-wheel drive and in one of four trim levels. The Sport model is the entry-level choice, but it comes loaded with features. You get 60/40 split-and-folding rear seats, a rearview camera, push-button ignition, a removable cargo floor panel, a 5-inch touchscreen, and a USB port. You also can get multiple available upgrades via packages like the Sport Appearance, Power & Air Group, and Uconnect 7.0 Group. Moving up to the Latitude model gives you all those features plus ambient LED lighting, an extra USB port, automatic headlights, fog lights, and leather on the steering wheel. you can customize this trim with the Altitude package. The Limited trim gets an upgraded engine, the wiper deicer, keyless ignition and remote engine start, a household-style outlet, 8-way power adjustment for the driver, and a 40/20/40 rear seat. The Renegade Trailhawk is the model for Ohio drivers who love adventure. It features a raised suspension, underbody skid plates, four-wheel drive featuring low-range settings, all-terrain tires, a full-size spare, and more. Our location in Piqua, Ohio, makes Sherry Chrysler centrally located and ready to serve drivers from the surrounding area. It is easy to make your way to our dealership along the various major highways. 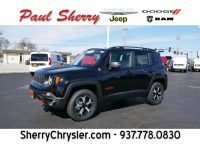 Once you get here, our team will gladly show you the Jeep Renegade in person and go over the extensive list of options and configurations with you.